Game 1: Toronto at Cleveland, Tuesday, May 17 at 8:30 p.m.
Game 2: Toronto at Cleveland, Thursday, May 19 at 8:30 p.m.
Game 3: Cleveland at Toronto, Saturday, May 21 at 8:30 p.m.
Game 4: Cleveland at Toronto, Monday, May 23 at 8:30 p.m.
After steamrolling through the first two rounds of the playoffs, the Cavaliers are back in the Eastern Conference Finals for the second straight year. The Cavs will open up the ECF tonight at the Q against the Toronto Raptors. Cleveland has dominated their opponents so far by averaging a postseason-leading 16.8 three-pointers made on 46.2% shooting. If the Cavs can keep up their impressive shooting, this could be an ugly series. Cleveland’s NBA record 25 three pointers in Game 2 against Atlanta was a thing of beauty and it shows just how dangerous this team can be. Toronto is playing in the conference finals for the first time in franchise history. The Raptors enter this series after winning their first two matchups in seven games and they are a little banged up. Toronto center, Jonas Valaciunas will not play in Game 1 and is doubtful for Game 2 with an ankle injury. Raptors forward, DeMarre Carroll also battled a wrist injury in the Eastern Conference Semi-Finals. The depleted Raptors will need their two All-Stars, Kyle Lowry and Demar DeRozan (both have played with injuries of their own) to play at a high level to make this an interesting series. The duo combined for 63 of Toronto’s 116 points in Sunday’s game 7 win over Miami, but they are shooting a combined 36 percent after the first two rounds. If the Cavs can keep Lowry and DeRozan in check, this will be a quick series. The matchup to watch for in this series is between point guards, Kyrie Irving and Kyle Lowry. This year’s Eastern Conference Finals will feature a clash between two All-Star point guards and perhaps the two best guards in the Eastern Conference. Despite Lowry’s poor shooting percentage, he has shown up when it matters the most for Toronto this postseason. He struggled is a Game 1 loss to the Heat going 3-for-13, but on Sunday during Toronto’s second straight Game 7 this postseason, he was brilliant. 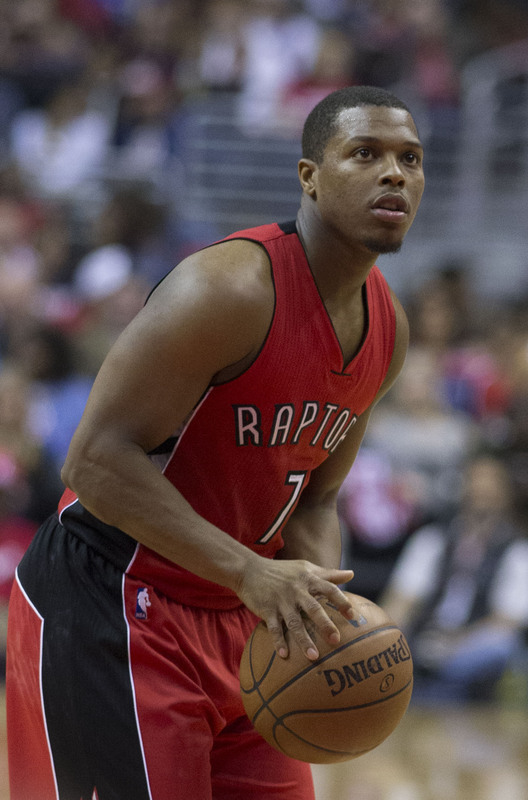 Lowry scored 35 points on 11 of 20 shots and added 9 assists in the series clinching win. He has been battling a right elbow injury since January and he had it drained in late March, which may explain his recent troubles. Kyrie Irving has been terrific so far this postseason leading the Cavaliers in scoring, averaging 24.4 points in eight games. Kyrie has showed a strong defensive effort so far in the playoffs by handling Detroit’s Reggie Jackson and Atlanta’s duo of Jeff Teague and Dennis Schroder. Irving will have more of a challenge against Lowry as he is a tough defender, and he hit can hurt you from both inside and outside of the paint. This will be an entertaining matchup to watch and I give the advantage to Kyrie Irving. 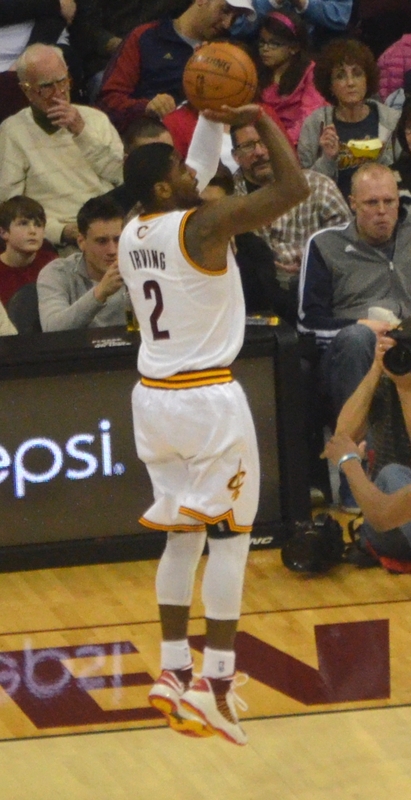 Kyrie has been on a roll so far this postseason and I think that will lead into success against Lowry. The Cavaliers can become the first team in NBA history to go 12-0 on its way to the Finals with a sweep of Toronto. The Cavs will knock off the Raptors in 5 games. The Cavaliers are coming off another week of rest and are ready to go. It has been a historic year for Canada’s only basketball franchise, but their magical run will come to an end in the Conference Finals. Unfortunately, Toronto is too injury plagued to make this the competitive series that it could be. The question for Cleveland is can they continue their historic three point shooting from the first two rounds. It’s hard for any team to shot like that, but this Cavaliers team is special and is poised for a monumental run in June. The Cavs have shown that they are a legitimate championship contender and they will prove that once again by advancing to the NBA Finals for the second straight year.